The Ride in New York not so much a sightseeing tour, but a unique experience. 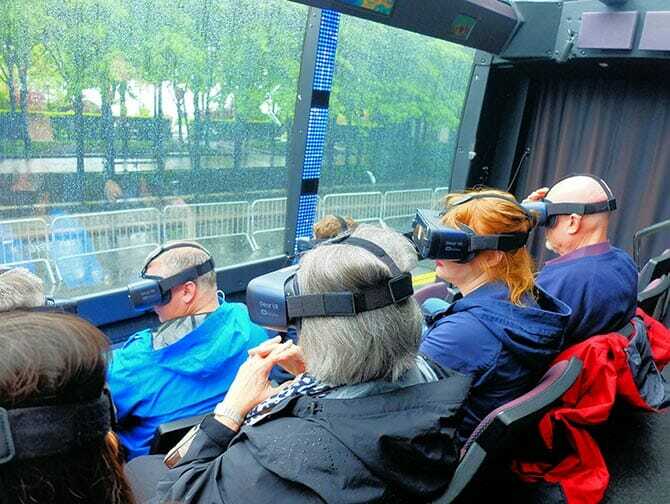 The technologically advanced bus takes you on an interactive tour around Manhattan. Think of The Ride as an ode to the eclectic mix of people that make New York City complex, interesting, and unpredictable! 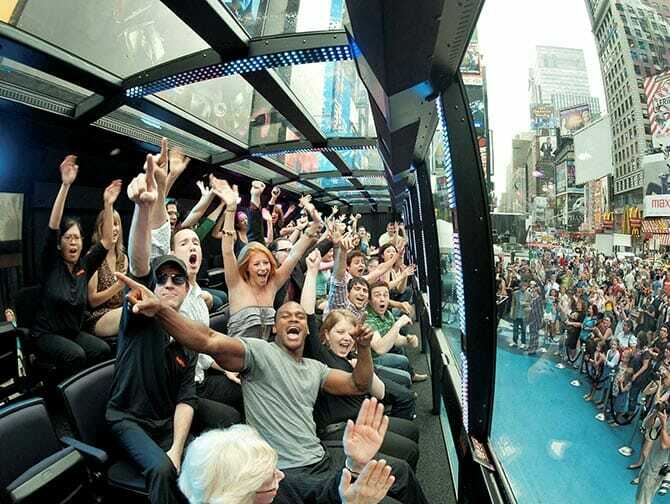 The Ride offers a special New York City experience to it’s visitors. Popular with locals and tourists alike. This tour with show-like elements, is interactive and full of improv, comedy acts, Broadway songs and performances and interesting facts about the city. It’s a great addition to your New York trip. 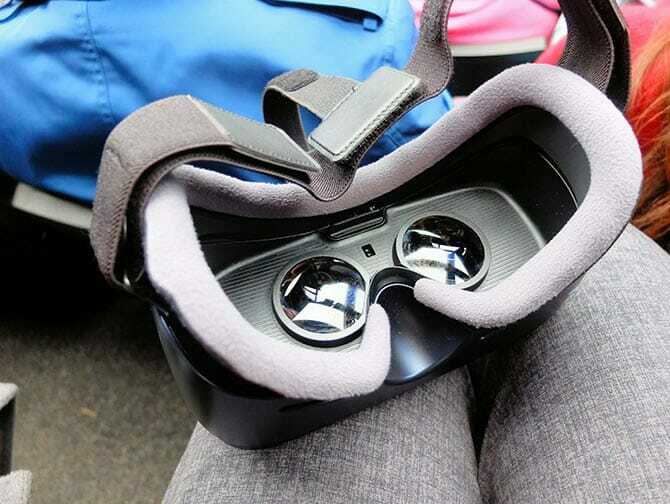 The Ride differs, mainly in terms of the entertainment factor, from the Hop on Hop off buses. The Ride is for people that want to have quick tour of the city while being entertained along the way. 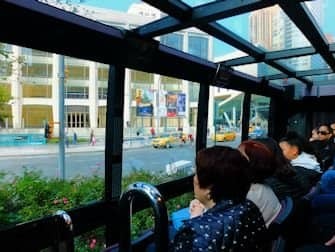 The bus takes you around the city in a 4.2-mile/6.8km loop which gives plenty of opportunity to take photos of some of New York’s most popular attractions. Experience the 75-minute ride in a technologically-advanced bus which seats 49 passangers, has 40 plasma screens and over 3000 LED lights. Most importantly, though are the huge panoramic windows which allow for excellent views of the streets of New York. In addition, the bus has three rows of stadium-like seating, which are positioned sideways; like a portable theatre. There are no bad seats on this bus! In addition, the Ride has a personality of its own: as it interacts with the comedians/hosts during the tour. It’s great fun to see your own surprised reactions, as well as those on the street. As you know, part of the charm of the streets of New York: strange stuff is not that unexpected. Definitely don’t expect to be able to hang in the background. No, this is a two-way-show! As soon as you board the bus you’ll meet the hosts; Scott and Jackie! The entertainment begins as son as the bus departs, you’ll be introduced to people on the street. Some of these people will be actors who are part of the show, some will simply be regular people on the street. 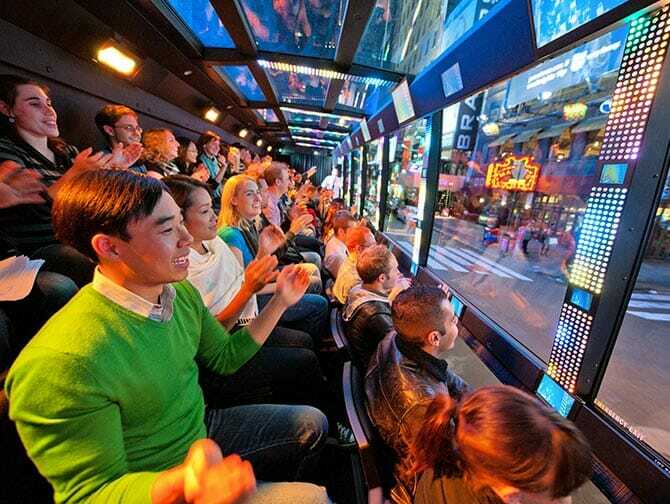 With the hosts and as a group, you’ll interact with the outside world by surprising them with the ‘wave’ or singing along to “New York, New York.” And that’s just the start of the tour! Along the way, you’ll be passing some of New Yorks most popular sights, such as the Empire State Building, Grand Central Terminal, Central Park, the Chrysler Building and Times Square. Prepare to be quizzed on your New York knowledge. You never know what to expect! After purchasing, you’ll receive a voucher that you can print and exchange for a ticket, or show as a mobile voucher on your phone. Is The Ride sold out on the day you want to go? Then The Tour is a good alternative. It’s also a bit cheaper. 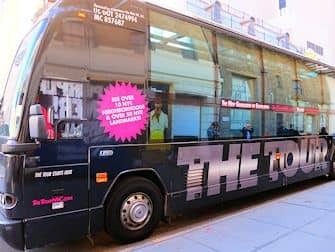 The Tour is similar to The Ride: in the same bus, but without the street performances. However, the Tour is still a fun experience. With an entertaining tour guide, sightseeing and an interactive bus which makes comments and tells jokes. If you have a New York Explorer Pass, The Tour is one of the options and you can even reserve your spot in advance.